Over the past few months we have met many solo travelers in their RVs. Some roam with a distinct purpose such as work, to avoid the snow, or to visit family. For others the purpose is less clear: they roam for the joy of it, to escape something, to explore. But in common the solo travelers seem very fulfilled, and none have ever seemed lonely. So for this reason I wanted to try a bit of solo Airstreaming myself. I am not moving around this week, due to being busy with work, but I am alone while Eleanor and Emma are visiting Vermont. I have been interested in finding out how the solo experience feels. When we were at Manatee State Park a couple of weeks ago, I met a fellow who was in his 50s, retired, gregarious, and yet fairly lonely. He volunteered at the park to fill his time, and chatted up anyone who walked by. He was interested in our travels and said he’d like to travel the country in an RV as well. So I asked him what was stopping him. “I think I’d be lonely,” he admitted. He was afraid that traveling alone would be an isolating experience. I think he pictured himself in remote spots, with no one nearby. But the reality of traveling this way is that you are usually surrounded by people who are sharing the experience. It is a conscious effort to slip away and find those moments of true privacy. Even in vast national parks, we meet new people every day and the opportunities to make friendships come regularly. Quite often we’ve met solo travelers along the road who have linked up with others in the same lifestyle. The road is far from a lonely, isolating experience — it’s a broadening experience in which you cannot help but meet people. That’s what I told him. And ever since that conversation, I’ve wondered what it would be like to travel without my family along, hoping to meet a special someone. Was I too optimistic in my advice? I don’t think so. We’ve made dozens of great friends through our Airstream travels, and we correspond with them via email and phone regularly, and visit them all over the country. Tonight, here in Tampa, I invited over two such friends, Brett and Barry, to come over for bachelor night at the campground. I would never have met either of these guys if it weren’t for Airstreaming, and they are close friends now. So what better way to celebrate the bonds of brotherhood than with a $4.99 disposable grill and a few cheeseburgers? Brett brought over the ice cream drumsticks, Barry brought his appetite, and then we sat around and talked about the things guys talk about: women, cars, Airstreams, and cheeseburgers. It was a great way to wrap up a busy work week. While I miss Eleanor and Emma, and talk to them every day on the phone, I can also see the appeal of solo Airstreaming. I have everything to myself, I can keep whatever schedule is convenient, and the efficient space of the Airstream is ideal for one person. If I ever get lonely, there’s always someone nearby to talk to — and if I get bored with my location, I can pack up and move to some place more exciting. It’s much more liberating than sitting in an apartment or house somewhere. If you are single and thinking about taking to the road, but afraid you’ll feel cut off, don’t be. The world can be your living room. Traveling solo may be the most invigorating thing you’ll ever do. Tonight we are concentrating on lighting. Some of it’s just fun stuff, some of it is practical. Last year we installed some cool blue neon tell-tales in our 1977 Argosy project. They lit up when the outside step light or patio light was on, so we wouldn’t forget to shut them off at night. I loved those blue lights. 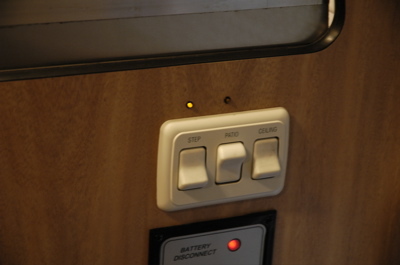 So Brett found some nice little amber LEDs and wired those into the switches of this 2005 Airstream. Cool! We also changed one of the lights over the bed. Airstream installs a omni-directional light in the ceilings of the new Safaris. When I come to bed late at night and Eleanor is already sleeping, I often use a flashlight to read so I don’t disturb her. But for some reason, Airstream installed a very fine directional halogen lamp in Emma’s bedroom area. In fact, because Emma’s bedroom area has two bunks, she has three. So we swapped one of her unused halogen lamps for my omnidirectional incandescent. Now I can read at night and the light will only hit my book. In fact it worked so well that Eleanor want us to do the same thing with her bedside lamp. We’ll hit that job a bit later. Brett has been so enthused by the success of these little upgrades that he is bubbling over with ideas. We’ll have to pick through them to decide what we can do over the next few days. I’ve been too busy working the past few days to get out and explore Tampa. But a list is developing, and once Eleanor is back on Monday I hope we have some fun. Not far from here are Ybor City (a historic Cuban district), Big Cat Rescue, all the Clearwater beaches, and lots more. I am hankering for some Cuban food, too. 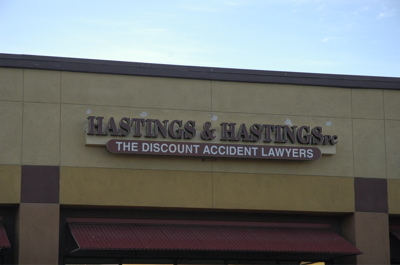 Sign of the week: Are these the guys you use to sue discount stores? OK, we’re on our way toward a more comfortable trailer! First, we got Eleanor and Emma on the airplane for Vermont, so I ‘m on my own for the rest of the week. That makes plenty of room for Brett and I to get into some interesting upgrades on the Tour trailer! This evening, Brett and I did some shopping, for a 20×16 HEPA furnace filter, some aluminum L-channel (1″), and a screen door spring. Then we rigged up a nifty filtration system for our furnace’s cold air return. As you can see, the original system just had a wide-open mesh. It wouldn’t filter out anything smaller than a hampster. But a high efficiency filter will easily filter out pollen, without impeding normal air flow. Here’s how we did it. First, we cut the aluminum L-channel to length and screwed it to the bottom of the cabinet. This provides a secure base to hold our HEPA filter. Then I cut the 16×20 HEPA filter in half, to make two 10×16 filters. The cut end goes down into the L-channel, so it won’t crush. 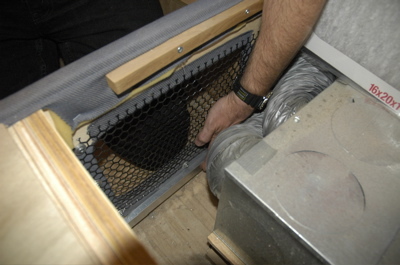 The spring is mounted to the wood and provides tension on the filter so it can’t go anywhere. Replacing a filter is easy, and since we get two filters for $9 (by cutting them in half), it’s inexpensive. Now, whenever we are in a place where it is cool at night during pollen season, as in Tampa right now, Eleanor will be more comfortable. When the furnace runs, it will be filtering out pollen rather than blowing it all over us! We’ve been so busy (me working, Eleanor prepping to go to Vermont) the past two days that we’ve hardly had a chance to explore the area. Since we’ll be here two weeks, we really ought to get to know the area we are in, so today I took a break and found out where the post office is, where the grocery is, etc. It’s a funny thing, getting acquainted with an area. When we were traveling through little towns on the California coast last December, it was easy. But big metros like Tampa are a completely different challenge. Every long 4-lane artery looks the same. We rely on our GPS database, the Internet, and local contacts to help us find what we need. Being gregarious helps. It hasn’t all been work, however. Tonight, Emma and I again joined some local friends for …. yes … bowling. I’ve done more bowling in the past week than I have in the previous two years. My game remains pitiful, however. Emma nearly beat me. She drops the ball on the runway and it slowly meanders down the lane and knocks over a bunch of pins. I swing the ball dramatically and manage to hit only one, with the gutter bumpers up. I wanted to bring you some photos of us bowling but I was distracted by Eleanor not feeling well again, and so I left the camera at home. 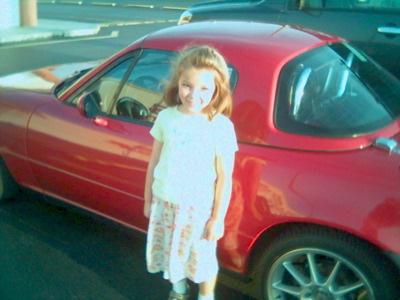 Instead, I snapped a shot of Emma by Barry’s hot little Miata with my cameraphone. This cameraphone takes what are likely the world’s worst pictures. We are all stressed by Eleanor’s continuing allergy problems, and they would prevent us from doing much outside this week. So I am glad she is flying to the land of low pollen count tomorrow morning (Vermont). Hopefully she will return with a better prescription medicine in hand. In the meantime, my bachelor friends are compiling ideas of what we should do while they are gone, and I am compiling lists of fixes and upgrades I want to make to the Tour trailer. 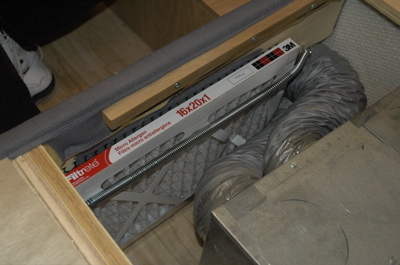 The idea of retrofitting a HEPA filter into the A/C has been dropped — there’s no room in there. But I’m still working on other ideas. I’ll document the work that gets done this week. We’re pretty sure that Eleanor’s recent illness has been due to the incredible pollen load here in Florida. The weather report for this area shows “very high” pollen outlook and it has been just monstrous since we arrived in Pensacola a couple of weeks ago. Eleanor has been feeling it again lately, with lots of unpleasant symptoms. Emma’s eyes are a bit red too. Even I am feeling itchy eyes at night and I don’t have that kind of allergies. So, we are going to make some modifications to the Airstream. Brett and I spent part of the evening looking at HEPA filters. My idea is to add a HEPA filter to the cold air return for the furnace, and also see if I can retrofit a pair into the Dometic air conditioner. The furnace has no filter at all right now, and the filters that are built into the air conditioner are just for dust. Eleanor will be seeing her doctor in Vermont later this week about new allergy meds, and while she is gone, I plan to work on the retrofits. I’ll also wipe down the interior of the trailer to try to eliminate pollen as much as I can. My friend and fellow full-timer Rich Charpentier is going through this process as well, since he has horrible allergies that are disrupting his life. He’s considering switching from an Airstream Safari to an International CCD or Safari Special just to get away from fabrics and carpeting. You can read about his saga on his daily blog. If we had no commitments out east, I’d be heading back to the southwest right now. Tucson was great — we could spend more time there. But since we have things to do here in Florida and South Carolina through the end of April, we’ll stick it out and hope Eleanor can get on some better allergy medications. Next year, we’ll be better prepared and we might arrange our schedule to be sure to avoid the spring pollen season. 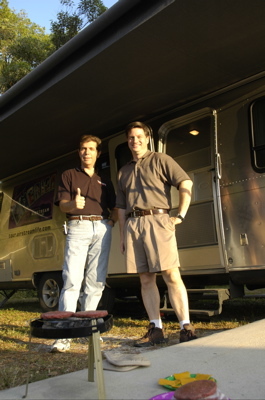 We packed up the roadshow at Fort Wilderness this morning, and pointed the Airstream west on I-4 to return to Tampa. With no particular schedule, we weren’t in a hurry to move on, so we stopped off at Camping World to pick up a few items and have lunch in Brett’s motorhome. maintenance items. At the time, I listed a few basic things we do. Since then, I’ve added a few items to the list and deleted others. This morning as we were preparing to go, I was noting that most of them have to do with lubrication. For example, the entrance door hinges started squeaking a few weeks ago. I used powdered graphite in a liquid suspension for that — the same stuff I use on the compartment locks. While we were at Camping World, I bought a level for the front of the Airstream. Up to now, we’ve determined level just by feel. We’ll be attaching the new level to the front of the trailer next weekend. Most of the projects I get into on the trailer are like that, little improvements rather than repairs (like our modification of the LCD TV to 12v). We’ve got a few other tweaks in mind for this week as well. On Wednesday, Eleanor and Emma are flying home to Vermont for a visit, while I hang back here in Tampa doing “guy stuff” with my friends. This will be the first time we’ve been separated on this trip. It should be an interesting change for a few days. What might happen? Probably more maintenance! We’re planning to use the interim to do some long-term planning, also. We need to cross the country again, and we want to make the most of every mile. I’ll be working out routes and stops from Myrtle Beach to Las Vegas, and then to Salem, Oregon. We need to cover the country in less than two months, which is faster than we’d like. With good planning, we’ll be able to take advantage of courtesy parking and see some great parks. As we work out the stops, I’ll post them to the Schedule page. I’m dragging myself to the keyboard tonight but it’s an effort. Brett (a.k.a. 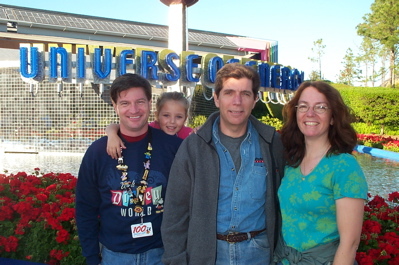 Energizer Bunny) led us on another full day of theme park adventures. He keeps going and going when ordinary humans start to fade. It’s 10 pm and by the time I’m done typing this I expect to find Eleanor and Emma already fast asleep. I won’t be far behind. Barry joined us today, so we had four parents and only one kid, which made childcare easy. But pretty soon it was five kids, and no parents. We started with MGM Studios in the morning (Tower of Terror is great way to wake up ““ who needs caffeine? ), EPCOT in the afternoon, dinner at Marrakesh, and then one last ride before fireworks over the lake. It was a great day. So here we are, back at the Airstreams in Fort Wilderness, worn out (again) but happy. We’ll sleep well. Too bad it has to wrap up tomorrow. We’ve got a blueberry pancake breakfast planned at Brett’s motorhome, and then we’ll all hitch up and head to Tampa. This has been a flawless Disney weekend, but our fun in Florida is just beginning. I’ll update you on the next set of plans later this week.